Took a quick a.m. drive to Venice Beach before tech-scouting and kicking off our latest production in Los Angeles. Venice Beach never ceases to present visuals and it's always near top of the list for places to take in when we're back in the city. Earlier this year Todd Lipscomb, front man and lead singer for the band The Kentucky Struts, contacted us about collaborating on a project regarding the band's new album, "The Year of the Horse." The idea behind the project is to have an original piece of art created for each of the twelve tracks that will debut once a month throughout 2011, until the album is released in its entirety. 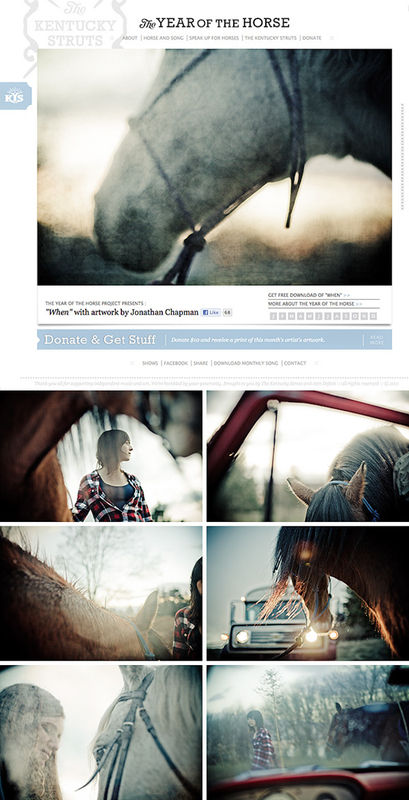 Our contribution for the May release of the track "When" was shot on location at Sunnyside Stables in Rosemount, MN. We worked closely with riding instructor Maria Crane to coordinate the use of her two horses and a couple models to round out the shoot. The location and all participants in the project worked out really well, and even the weather did its part to provide a wide range of options within the rain, sleet, and sun of the early evening. In addition to the final selected image, you can see some additional outtakes above. We are very excited to have a hand in this month's artwork and be a part of the album as a whole. Fans of the album can make a donation on the Kentucky Struts' website and in return receive a print of the current artwork of which all proceeds will be donated in the artist's name to Speak Up For Horses - a horse rescue foundation based in Falmouth, KY. Enjoy the artwork and the fresh tune "When" from the Kentucky Struts. Stay tuned for the June installment of The Year of the Horse. As promised in our "BSC via Olson, volume 1" post we have a time-lapse of our two-day studio portion of the shoot as well as examples of the stills we were capturing. The time went rather quickly as we were all focused on making sure every last detail was covered. A big thanks to Bobbi Peacock for juggling this production, as well as Janna Chin and her assistant Lorraine Goddard for their constant smiles amid the massive task of prop and wardrobe wrangling. Thanks to Raoul at Flashlight for suggesting we try the Euro Mola light, which worked out great, and as always, thanks goes out to Sarah and Bob at Orbit for the studio space we always look forward to working in. Lastly, thanks to Mark Pakulski and Adam Hoganson at Olson along with everyone else who helped pull this together. Always great partnering with you guys! The behind the scenes time-lapse is quickly becoming a part of our regular routine and we will certainly be doing more of this in the future.